When I got home from work on Thursday, we discovered our mini-goat, Hondo, had a huge gash on the back of his hind leg. He couldn’t even walk on it, and he was just beside himself not being able to run about in his usual playful way. It pained me to see him with such different energy. He just sat there and sulked. I didn’t have the heart (or the stomach) to look closely at the wound but my husband did. He said it looked like the tendon behind the knee was severed completely. He bandaged it up and said that Hondo would “probably heal” and that we’d just have a hobbling goat. In true Kellie fashion, my anxiety got the best of me and I tossed & turned all night long thinking of Hondo. The thought of him in pain made me restless & anxious. In the morning, I rushed out to the backyard to check on him. He was in the same spot I had left him the night before, sitting there, spirits low, and depressed. I gave him kisses & brought him a bowl of feed. I went to work and worried all morning long. I finally decided to call around to the vets in town to seek a solution. I finally got referred to one who had dealt with “farm animals” and he said that I would have to bring him in so that the wound could be examined. But he was honest with me, he said the possibility of repairing a severed Achilles tendon was a longshot, that the success of such a surgery would be slim and that he’d recommend putting the goat down if the tendon was in fact severed. I felt my voice get shaky as I agreed to take the goat to his clinic. I hung up the phone and immediately burst into tears. Unfortunately I was sitting at my desk at work and my cries weren’t ignorable. My coworkers tried to console me but I was a wreck. 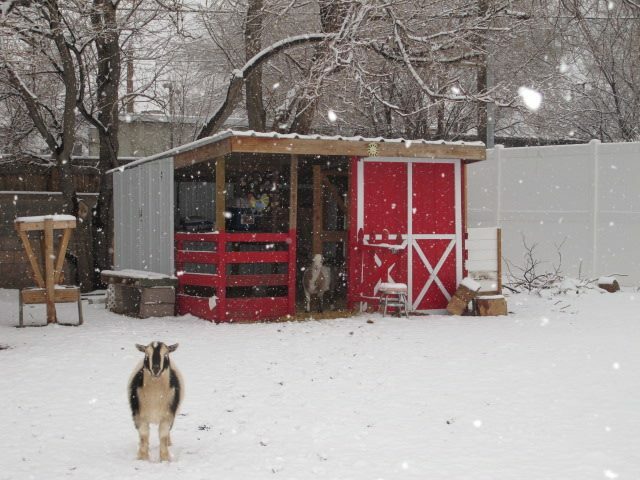 The thought of having to put my beloved mini-goat to sleep was unimaginable. He had only been in my life since he was just a baby, just 6 months prior, but he was my absolute favorite on our little Urban Farm. Any time I would go into the yard, he would get all excited and run over the gate that I would be entering the yard from. He would follow me all the way to the little barn, he’d rest his head against my leg as I got his feed from the shelf. He’d lightly chew at the hem on my skirts or dresses (I interpreted those as kisses because he’d never really tear my clothes, he just liked to kinda tease & play). Any time he would get into the inner yard (the “off limits” yard), he’d always make me carry him back out to the outside “animal” yard because he would refuse to go on his own (I think he just liked me to carry him). Every morning, I would wake up to him & his brother bouncing around on the fishermans boat that we had put in the backyard. They loved to chase each other onto that boat, and it would make loud hollow booms every time they jumped on it (it was probably really annoying to the neighbors, but I kinda liked it). Every day when I would park my car in the drive way after work, I would hear him baaaaaa’ing for me, calling for me, begging for dinner. I left work and went to my house to pick up Hondo for his wound examination. He sat in the same place in the yard that he was when I left him that morning. This time, all of the other animals sat around him like they were keeping him company, like they knew something was amiss. The turkey & the chicken on his right and the other goat on his left. It brought me to tears again. I carried him to my car and headed out to the vets office. The whole car ride Hondo was so sweet, just calm and resting his head on my leg. His long eyelashes tickling my thigh. I cried the whole way there, thinking of what might be his fate. I pulled myself together to check him in at the front desk of the vets office. But when I brought him inside, he let out a loud baaaaaaa and I lost it again. Tears filled my eyes, and as the vet called us to the back, all I could see were foggy tear filled silhouettes of people & doorways. I felt sick with worry. I comforted & whispered to Hondo as he struggled to get away from them as they were cutting off the bandage that my husband had wrapped his leg in. They soon confirmed my worst fears, that his hind leg tendon was completely severed. I sobbed & sobbed uncontrollably, and just then, seeing my complete dismay, the vet said,”Well, lets try one more thing…” and he told his assistant to carry Hondo out the back door. Within a minute he returned and said, “He can walk on 3 legs, so in all actuality, we could amputate at the hip and he may be able to get by with 3 legs, but given the fact that he’s only 8 months old and that he’s likely to get much bigger and that most farm animals and hoofed animals cannot get by on 3 legs, like dogs can, due to their center of gravity, I would recommend for his quality of life that you put him down”….. I searched my mind for any other possible option but my mind was going blank. I felt numb. I didn’t know what to do. I asked to use the phone so that I could call my husband so that he could help me make the best decision. After talking it over with him, the only logical decision was to go with the vets recommendation. It made sense, even though my heart was fighting it. They left me out back with Hondo to tell him goodbye. I sat on a bucket and cried. I kissed his face over & over again. I couldn’t believe that this was it, the last time I would be in the presence of his little spunky spirit and hold his sweet goat face in my hands. I tried to tell myself, “it’s JUST a goat” but my heart ached with overwhelming sadness. I thought of how I would tell my toddlers that Hondo wasn’t ever coming back home. 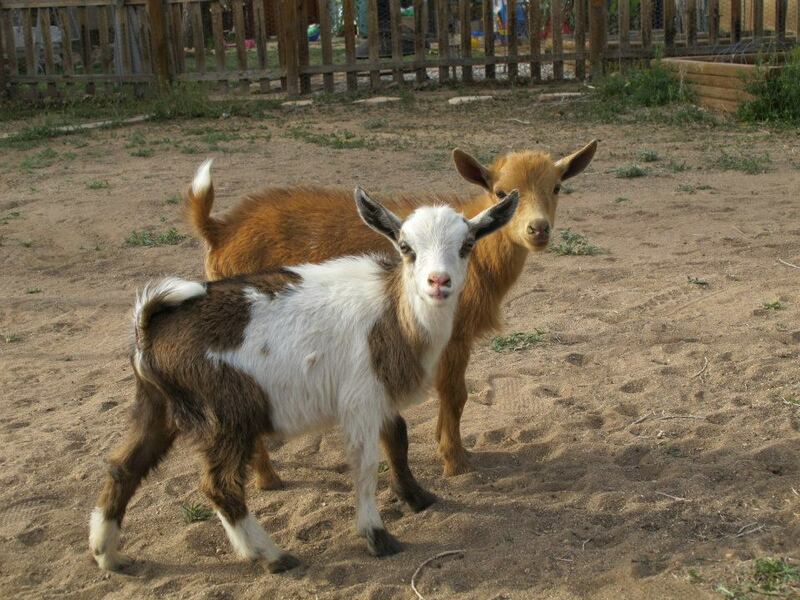 I thought of how lonely his goat brother, Pecos, would be without him. It took me a long time to leave the vets office after everything was done. I tried to collect myself in my car by listening to music. When I finally got on the highway, I looked down and I had Hondo’s hairs all over my skirt. I pressed my hands to my face to smell him again. My sweet Hondo. I will miss you.